Solid intelligence told the Israeli army that a Hizballah unit was in a house in a small south Lebanese village. Infantry soldiers from the Nahal Brigade were dispatched to eliminate the Iranian-armed terrorists. Under clear, mid-summer night skies, the platoon closed in on the village. They moved stealthily across rugged terrain, down steep ravines, through the rocky scrubland then through heavily wooded brush. They had already been moving on foot for a number of hours in full battle dress, carrying their weapons and other equipment. They were hot, sweating heavily, dusty. If they felt tired, the adrenalin of such a dangerous situation kept them alert and ready. Cries of 'Allah Hu Akbar' bellowed amid automatic gunfire as soon as they broke cover and moved on a targeted house. A hand grenade was thrown from the upstairs window. A colleague swiftly dragged a wounded soldier backwards behind the cover of a boulder, out of sight of the Hizballah fighters. 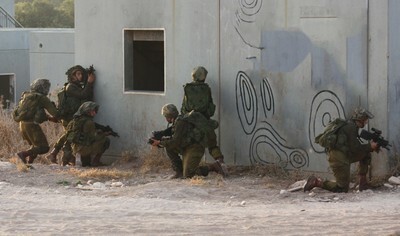 The Israelis burst into the house, checking for booby-trapped pressure pads at the doorways, then rushed the defenders. A short, but vicious fire-fight was over in less than two minutes. The outcome: two Hizballah terrorists dead, two Israeli soldiers injured (one severely). The target was made safe. Fortunately, this was a training drill, set in a scenario of renewed conflict with Hizballah in southern Lebanon. Israeli officials granted the Investigative Project on Terrorism access to observe it. 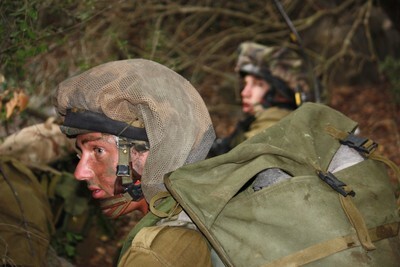 The young troops of the Nahal Brigade have been training for seven months. The village is a mock-up created by the IDF at the Elyakim base in the Carmel hills in northern Israel, a terrain similar to that found in southern Lebanon. It gives soldiers vital experience with the potential dangers they might face in a future conflict. As many as 100,000 missiles have reportedly found their way into the hands of Sheikh Hassan Nasrallah's Iranian-backed Hizballah since Israel unilaterally withdrew from southern Lebanon in 2000. That arsenal might at any time spark a new conflict. The rapidly deteriorating situation in neighboring Syria has attracted elements of al-Qaida and a raft of radical Islamist groups fighting under the banner of the Free Syrian Army move into the area. They could pose an additional threat to the Jewish state. Closing in on their target. The exercise showed the many challenges Israeli troops face during urban warfare. For example, reaching the target took longer than expected, and the unit lost the cover of darkness. The delay meant the raid came after the first call to prayer rang out across the valley, raising the possibility of civilians being in the line of fire. Even more care would have to be taken to avoid civilian casualties, regardless of whether Hizballah had imposed itself on the people of the village or were welcome guests. Lt. Archi Leonard Cohen, deputy commander of the Nahal Guerilla Warfare Brigade, spelled out the objective of this particular exercise. "The brush leads all the way to the village. The main street is often the most problematic section because it is often booby trapped. Then there is the casbah, normally at the center of the village. The soldiers are doing a three-hour hike before attacking the building. They will come through the brush then they'll cross the street and capture the building." The platoon commander, Captain Sarel Sabag, joined us. I asked if the chaos in Syria meant that these training exercises carried more significance. "You don't know where you might have to intervene," Sabag explained. "Lebanon? Syria? Now with the events in Egypt, who knows? These soldiers have only just moved on from basic training. This is one of their first exercises. In a few months they will be doing more complicated training exercises." "There is the issue that Hizballah place themselves amongst the [civilian] populations - in the mosques, in the schools. It's complicated," Sabag continued. "We try not to enter holy places, but we understand that Hizballah often use mosques, schools, and even kindergartens. If they are firing on us from inside the mosque for example, a school, or even a private house, we have to respond." Fighting amid human shields is especially challenging. Civilian casualties prompt massive media criticism against the IDF without recognition that Hizballah, Hamas, and other Islamist terror groups, regularly place civilians in harms' way. "There are civilians that support Hizballah and those that don't, but I believe that most residents don't want to get involved," Sabag said. "They just want peace and quiet. Human shields are the most complicated thing. If it was an open area and it was us against them [Hizballah], it would be fairly straight forward. But when they use human shields every soldier knows that any house could explode, any car could potentially explode." "We train a lot these days about ethics, the value of life, things we didn't talk about years ago. Now it's much more of an issue," he said. "All the officer courses focus on this. You have to get to the Hizballah, but it's not at all costs. The [classic] training says that every building you go in you should throw a grenade first of all. Why be the first one in? But if we suspect there might be civilians inside we prefer not to throw grenades in. We first go in without even firing, trying to clear it out to avoid harming civilians." That holds true even though it has cost Israeli soldiers their lives. "I don't think the world appreciates the steps the Israeli army takes to minimise civilian casualties," Cohen said. "But understand that we don't do it to satisfy world opinion. Many Israeli men have been in the army and been in combat. They have families and children, and I think for their own conscience it gives them more strength knowing that the army they fight for is a moral army." Recent reports suggest a new range of high specification weapons reaching the hands of both Hizballah and elements of the Free Syrian Army, including sniper rifles with a range of up to one mile. "We always train for facing snipers" Cohen said. "When we move somewhere on foot we do so in the safest way we can, but it is part of the risks we take. Here, [in this training scenario] the distance doesn't give them such an advantage. For this we have a different way of fighting. Hand-to-hand combat is very rare, but we learn Krav Maga [Israeli military martial arts] to build self-confidence, although we don't expect to have to use this technique in combat situations. We are very well equipped and our soldiers have the Micro Tavor [assault rifle]. The tactics we use in the brush are obviously different to an open area." Walking through the mock-up village, it is striking is how narrow the streets are and the number of blind corners around which your enemy might be ready to pounce at any moment. "In this training village we have a small casbah" Cohen pointed out. "All the time we aim at giving each other cover. We know that when we are on the move covering fire is less effective than static cover fire. When we fight in the main street we use tanks to fight with us." Hizballah and other terror groups are always quick to portray the civilian deaths as Israeli blood-lust, and there are plenty with set agendas in the international media prepared to accept this view without question. Errors will always be made in the heat of battle, but Cohen robustly defended the training given to Israel's military with regard to civilian casualties. A mock tunnel used for training. Much has been written about the tunnels in Gaza where goods and weapons are smuggled into the Islamist enclave, but Cohen confirmed that Hizballah also has a huge amount of tunnels leading from village houses, mosques, and other buildings, and often leading outside the village. Hizballah fighters try to use these tunnels to emerge behind their attackers. 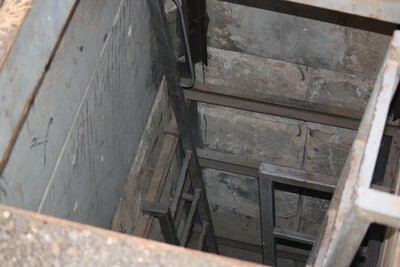 The tunnels are often built with cement reinforcements sometimes two meters high, allowing the terrorists to dash back and forth, emerging from unexpected angles, and often giving the impression there are more of them than is actually the case. Even the tunnels have been recreated in the mock village. "The tunnel openings inside houses are not normally covered even with a carpet. They are in clear sight so they can be used at a moment's notice without anything slowing them down," Cohen said. "If they fire rockets at us and we identify where they are specifically firing from, that building will be targeted, but not the one next door." Even if the house from which Hizballah has fired is destroyed by a retaliatory Israeli missile strike, the tunnels often provide the terrorists a quick means of escape. Shia Muslim Hizballah fighters are currently embroiled in vicious fighting against the Sunnis in Syria. It seems unlikely in the current circumstances that they will seek another front and take on the might of the Israeli army, but no one in Israel takes anything for granted. With so much of the Arab world now in turmoil, Israel remains ready to defend itself against terror attacks from Lebanese, Syrian, Gazan, or even Egyptian soil, the moment the wind changes – and that can be in an instant.